What do you think you gained from studying abroad? I struggle to put into words exactly what I gained from my trip because it has changed nearly every aspect of my life. I experienced a tremendous amount of personal and professional growth as a result of being completely immersed in the culture and language of the indigenous populations. I gained innumerable skills that are applicable to my interests as a potential medical student, as well as Spanish terminology associated with medicine and dentistry, and basic masonry skills from building composting latrines in the community. Greater than any skills I gained was an understanding that is best captured by the words of French activist Simone de Beauvoir, “the fact that we are human beings is infinitely more important than all the peculiarities that distinguish human beings from one another”. Both the brigade team and the community taught me firsthand the value of humanity, and just how vital public health education and basic medical care are to quality of life. This trip solidified my interests in medicine and public health, and I now know that I want to continue to serve on medical brigades as a health professional, in the hopes of sharing my passion with other students. 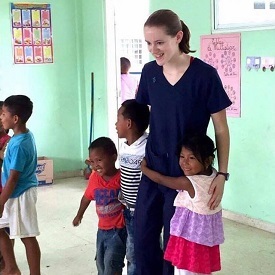 This study abroad program is not currently attached to any academic credit; however this experience was geared toward my career interests and hands-on experience working with people and serving in a clinic was invaluable. 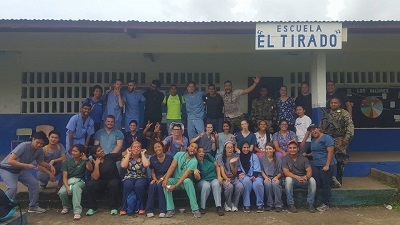 I went to Panama as a member of the IUPUI chapter of Global Medical and Dental Brigades. Global Brigades is an international non-profit that works to empower underserved communities to meet their health and economic goals through university volunteers and local teams. We arrived to our compound so late at night, that the entire first day of traveling seemed surreal. My first morning in Panama was filled with new people and a new way of life, and yet I did not feel out of place. I think I had gone into the trip with such an open mind that I was easily able to adapt to the new environment. We were housed in a compound owned by a local volunteer organization with students from other universities and brigades. It was similar to a cabin setup at a summer camp, where people slept in bunk beds, shared a room with many other students, as well as a bathroom. There was a common dining area, as well as a large lawn on which to play and relax after the day’s activities. I work part time, and I made sure to save a portion of my income each month for the trip. Global Medical Brigades has many fundraising ideas and activities that help alleviate some of the financial burden. I also made it a point to take only cash with me to Panama; there were no card readers to be found in the markets we visited. Each evening upon returning to our compound, we had free time in which played volleyball, soccer, and card games with students from other universities. On our final day in Panama, one community we worked with that week held a welcoming ceremony for us, in which they shared their culture. This experience was unique and went beyond sightseeing common tourist destinations; we were a part of their community. My ability to converse in Spanish was limited, but even with the language barrier the members of the community were incredibly patient. At the welcoming ceremony, community members made it a point to involve us in their community by sharing their music, dance and food, and handmade wares. People in these indigenous communities place incredible value on their culture and community. Regardless of the program, it is vital to keep an open mind when thinking of going abroad; always be willing to try new things and see something from another culture’s perspective! If you are interested in a career in the nonprofit sector in public health, or in healthcare, consider joining the IUPUI chapter of Global Medical and Dental Brigades! We are a close-knit group of students who work to promote health and community involvement by volunteering in Indy, as well as abroad.